A gift for my cousin Hans. 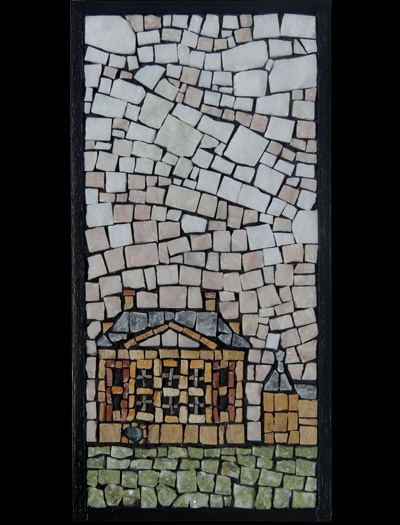 The idea for this mosaic sprang from the detailed information Hans provided when a trip to Nederland was in the works. One item he provided; a postcard with an arial view of the Den Haag; a pinprick indicating the location of the Mauritshuis.This was his way of clearing up my muddling of some facts as to where a beloved painting resided. Depicted is the Mauritshuis with its own pinprick of glass (see close ups). The large quantity of sky is a nod to the many paintings in which the Dutch sky features so prominently. "Hier" is Dutch for "here". So, a thank you to Hans for providing much crucial information and assistance for the trip. But more specifically, a stone interpretation of his memorable postcard which continues to make me smile. It's always the simple things.